CC: Wow - great initial impact. The frame is full, the pattern covers almost the entire shot, and the symmetry is obvious. A very good shot for this challenge. 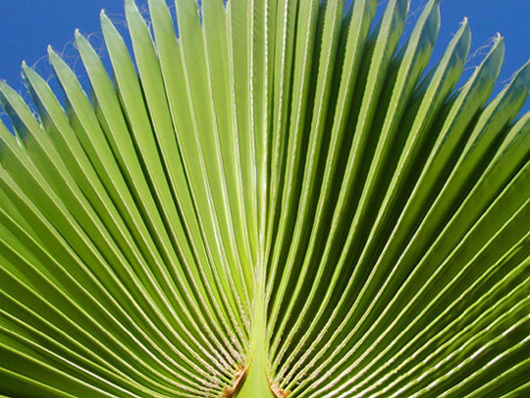 The composition is good - although it feels a bit amputated at the top, as if you couldn't decide whether to show all of the tips of the frond, or show none of the tips. I think I'd have prefered to see one extreme or the either - either no blue sky/ background at all, or all of the tips visible. The side lighting has worked well to show the depth of the leaf, although some of the highlights on the tops seem to be slightly blown out. This sort of harsh sidelight is hard to expose for well. All in all a good entry, but I personally think a tighter crop would have been more decisive. Nice image. Nice display of symmetry and patterns. Good job. excellent example of natural symmetry. The tight crop forces you to focus on the repeating patterns. A tad off center. I would have cropped more off the right. Needs a little sharpen too. I like the texture of this photo. I would have liked to see a little more of this--ie, the tips of the fan on top, etc. Proudly hosted by Sargasso Networks. Current Server Time: 04/19/2019 04:14:39 PM EDT.